We are so lucky to have a great year-round market here in Charlotte that features local farmers, specialty food and craft vendors. 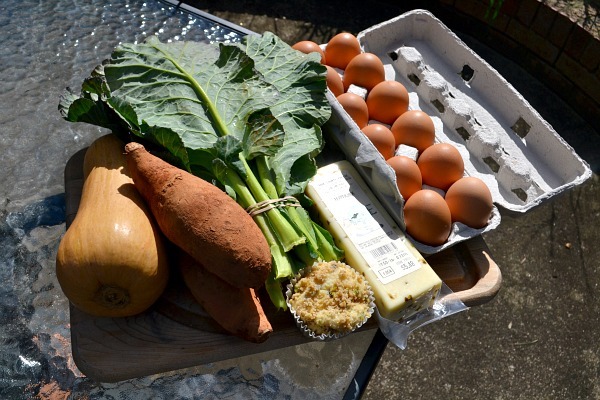 I try to make it to the Atherton Mill Market a couple of times a month during the winter to pick up fresh eggs, local cheeses and whatever winter produce looks good. My produce purchases have featured a lot of greens, sweet potatoes and various winter squash. I love all of these foods but I’m guilty of sticking to the same preparation methods due to ease and lack of time. I actually had some downtime last night to spend in the kitchen so I started researching recipes that used the ingredients I had on hand and found an amazing sounding vegetarian curry on Smitten Kitchen. Deb’s recipe was for Curried Lentils and Sweet Potatoes with Swiss Chard. I used her recipe as a guide but made quite a few changes based on what I had on hand in the kitchen. I used collards instead of swiss chard but I think any winter green would work well in this dish. I also omitted some ingredients that I didn’t have and substituted others. The resulting dish was still incredible and I couldn’t get over how well all of the flavors came together. 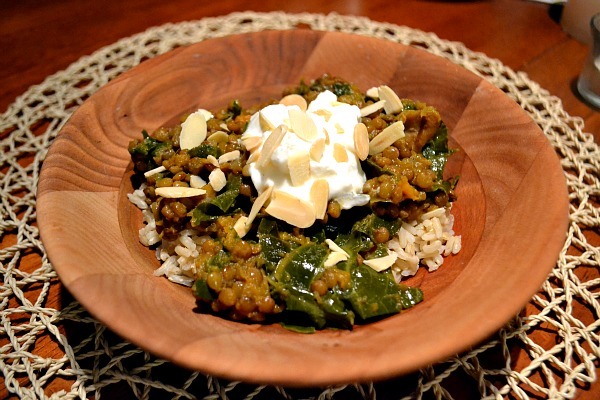 I am a big fan of curry and I loved this vegetarian combo that was protein-packed thanks to the lentils. I served the curry over brown rice and topped it with plain Greek yogurt and a sprinkle of almonds. The Greek yogurt was a nice touch to cool it down a bit (I was a little heavy handed with the cayenne pepper – I love spice!). I can only imagine that the leftovers will be even better after the flavors have a chance to develop even more with time. Heat oil in a large saucepan over medium heat. Add onion and cook until soft and translucent, about 5-7 minutes. Add the garlic, ginger, gramam masala, curry powder and cayenne and sauté, stirring constantly, for about one minute. Will be very fragrant. Stir in 2 cups of broth, sweet potatoes, lentils and bay leaf. Increase to high heat and bring mixture to a boil. Once boiling, reduce heat to medium and partially cover (leave the lid ajar). Simmer for 25 minutes. (If lentils soak up all the broth, add up to 1 more cup of stock, slowly, as needed.) Stir in greens and salt and continue cooking until lentils and greens are tender. Start checking after about 25 minutes. It can take up to 45 depending on your greens and lentils. Just before serving, stir in lime zest and juice. Serve over desired base – rice, quinoa, etc. or on its own. Top with garnishes of your choice. Herbs de Provence is one of my favorite spices but I don’t find many opportunities to use it. I ran across this recipe for Herb-Rubbed Chicken with Creamy Orzo on Annie’s Eats a few years ago and have been making variations of it ever since. I really like recipes where chicken is braised in liquid. It’s a fool-proof, forgiving method for getting juicy, perfectly cooked chicken. The original recipe includes heavy cream but think all the other flavors are so great that I don’t need more than just a sprinkle of parmesan at the end. Season chicken with salt, pepper and herbs de provence. Set aside. Preheat a large sautee pan (with a lid) over medium heat. Add olive oil and heat until shimmering. Add onion and cook for 3-4 minutes, stirring frequently. Add garlic and cook for another minute. Add chicken and let cook for about 5 minutes until browned on one side. 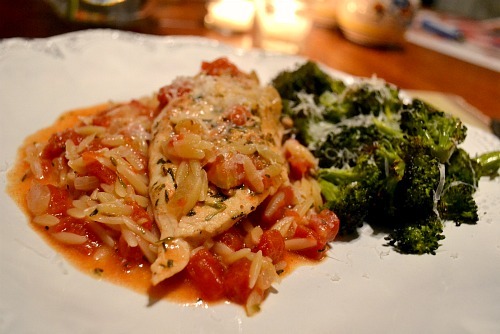 Remove chicken from pan and add orzo, tomatoes and chicken broth. Stir and return chicken to pan, browned side up. Cover and let cook over medium-low heat for 15-20 minutes or until orzo is tender and internal temperature of chicken reads 160 degrees. We really enjoy noodle bowl creations but usually lean towards broth-based, curry flavored noodle bowls. This recipe caught my attention because I have never cooked with soba at home and it seemed healthy and satisfying. I’m in the midst of a 10 day break from meat so I added this vegetarian dish to this week’s menu. Soba noodles are Japanese thin noodles made from buckwheat flour. They are high in fiber contain all eight amino acids, making them a great source of vegetarian protein. I experienced some difficulty finding them in my normal store – they carried them but they were out of stock at two different stores. Brandon stopped by Earth Fare and discovered they had several different brands. If your local grocery doesn’t carry them check an Asian market or a health foods store or substitute whole wheat spaghetti. I was drawn to two different recipes – I liked the dressing from Annie’s Eats and the vegetable mixture for the noodles from a Gourmet recipe. I decided to combine the recipes and was pleased with the results. I also think this would be delicious with tofu or chicken added to the mix. Add this to your weekly menu plan as a meatless main! It’s easy, healthy and flavorful! In a medium bowl, whisk together all ingredients and set aside. Toast sesame seeds in a large, heavy skillet (not nonstick and with no oil) over medium heat. Stir often and cook until pale golden. Transfer to a small bowl. Heat oil in a skillet over medium-high heat. Saute mushrooms, stirring frequently, until they start to brown, about 4 minutes. Add ginger and garlic and cook for another 2 minutes. Reduce heat to medium and add cabbage and scallions. Cook, stirring occasionally, until cabbage is crisp but tender, about 6 minutes. Add sauce and simmer for another 2 minutes. While the cabbage is cooking, cook the soba and edamame together in a large pot of boiling salted water. Cook until noodles are just tender, about 5-6 minutes. Drain and rinse under cool water. 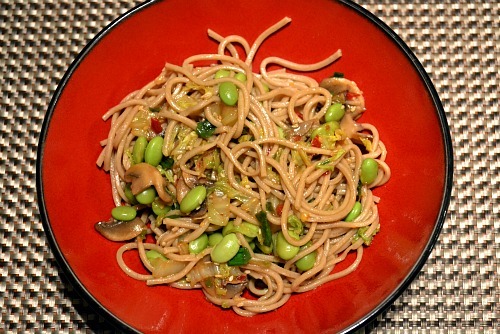 Transfer noodles to a large bowl and toss with sesame seeds and vegetable mixture. If you’ve been reading for a while then you might be familiar with my tendency to create a recipe including things like feta, spinach, sundried tomatoes and kalamata olives and call it Greek. Case in point – Greek Pasta, Greek Chicken Breasts and Greek Inspired Flounder. Actually, there are 11 recipes in my “Greek” category…right up there with the 12 in the “Italian” category. We just love foods with Mediterranean flavors! Brandon and I were enjoying happy hour at our local brewery last night and brainstorming ideas for dinner. 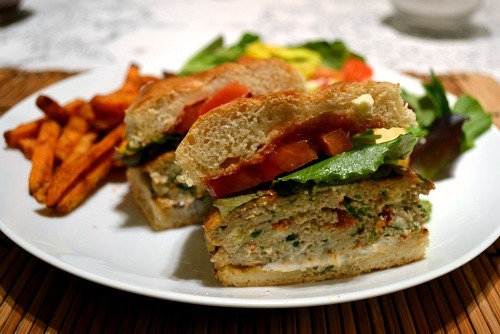 I remembered seeing feta and spinach turkey burgers on Jenna’s blog this week and I mentioned making an amped-up version of those. Brandon is always up for a good burger so he happily went along with the plan. We prefer ground chicken over turkey so we started with that as our base. I pretty much went through the fridge and pantry and added in anything that I thought went with my Greek chicken burger theme. We ended up mixing in sundried tomatoes, kalamata olives, spinach, feta, parsley and oregano. I made a spin on tzatziki sauce to accompany the burgers. 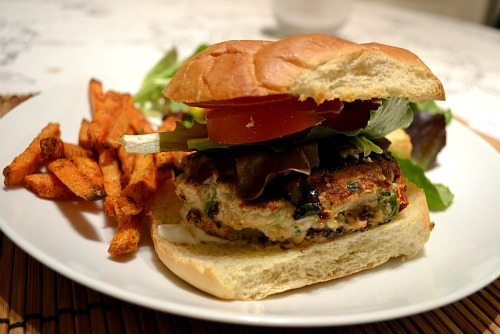 These “on the fly” burgers totally ended up exceeding our expectations. After all the mix-ins, this was definitely not your average boring chicken burger. They were so easy to make and full of flavor. I cooked them inside in a skillet but I’m sure they would be great grilled too. Whisk together ingredients for the sauce. Set aside. In a large bowl, combine all of the burger ingredients and mix together (it’s easiest to use your hands here). Form into four patties. The mixture will feel pretty wet and like it’s going to fall apart but it will firm as it cooks. Heat a large non-stick skillet over medium-high heat. Add a little oil and burgers. Cook about 6-8 minutes per side or until internal temperature reads at least 160 degrees in the thickest part of the burger. Serve on toasted, buttered buns with sauce, lettuce and tomato. Top with extra feta if desired. One of Brandon’s all-time favorite dinners is pasta with red sauce so I wasn’t surprised when he requested it for our first “return to normal eating and homecooked meals” after the holidays. I wasn’t really in the mood for traditional spaghetti sauce and Brandon suggested arrabbita sauce. Spicy homemade marinara sauce with pancetta sounded perfect. We usually top stuffed shells with arrabbita but I was not in the mood for the richness of stuffed shells after the holidays so we stuck with plain spaghetti noodles. This ended up being a great choice because it really allowed the awesome flavor of the arrabbita sauce to be the star. The pancetta is a must in the sauce – it adds so much flavor and richness. The red pepper flakes don’t dominate the dish but contribute a nice, slow burn. I used my go-to marinara sauce as the base for this sauce and added the sauteed pancetta and red pepper flakes at the end. 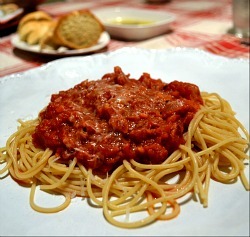 If you have never made homemade marinara sauce, you must! It tastes nothing like what you buy in a jar. I recommend doubling this recipe and keeping a batch in the freezer for a quick dinner option. It reheats wonderfully. Heat 2 tablespoons of olive oil in a medium saucepan over medium heat. Add onions and saute for about 5 minutes, until they begin to look translucent. Add garlic, celery and carrot and cook for another 5 minutes. Add wine, tomatoes, bay leaves, sugar and red wine. Simmer for 1 hour over low heat, uncovered. While sauce is simmering, heat a medium skillet over medium heat. Add 1 tablespoon of olive oil and then pancetta. Sautee about 5 minutes, or until it begins to look crispy. Add red pepper flakes and sautee for another 1-2 minutes. Remove from heat and stir into marinara sauce. Season with salt and pepper and stir in fresh basil right before serving. 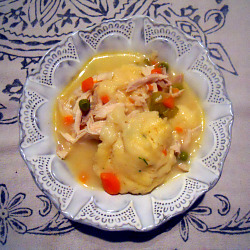 I am not exaggerating when I say that I have no reason to ever try another chicken and dumplings recipe. This one is going straight to the “tried and true, will make this for years and years to come” file. I have tried a lot of chicken and dumplings recipes and have never been blown away by any of them – except for this Chicken Pie With Biscuit Crust but it’s not truly chicken and dumplings. I was in the mood to cook on Saturday afternoon. I wanted to make a dinner that would take a while so that I could spend the evening hanging out in the kitchen, one of my favorite activities to relax and unwind. I chose this recipe from Tyler Florence because I loved that it featured homemade stock, sauce and dumplings. No canned stock, cream of yuckiness soup or refrigerated biscuits. I made the stock by placing an organic/free range chicken in a pot with garlic, peppercorns, thyme and salt. I covered the chicken with water and boiled. This was a great reminder that homemade stock is easy and far superior in flavor to what you buy in the store. While I am guilty of buying stock, I will be trying to keep some homemade stock in the freezer moving forward. I only used about half the stock this rendered in the chicken and dumplings so I was able to freeze a good amount of leftovers! I put Brandon to work shredding the cooked chicken while I prepared the sauce. I sauteed carrots, celery and garlic in a mixture of butter and oil and then added in flour to make a roux. I slowly incorporated the chicken stock and then added in extra veggies. I love that this recipe includes peas and pearl onions. The sauce simmered until it was thickened. You get a nice creaminess with the sauce by adding a little heavy cream at the end. Side note: please remember to taste your sauce as you go and season – you might need to add a good bit of salt. Soon enough it was time to add the chicken and dumplings and sit back and watch magic happen. I love dropping the dough in and then seeing it turn into perfect dumplings. While this is a labor intensive recipe, it is not hard. I highly encourage you to try this now that the temperatures are dropping and the leaves are turning. This dish is so comforting and it just feels good to eat it knowing that everything is made from scratch. 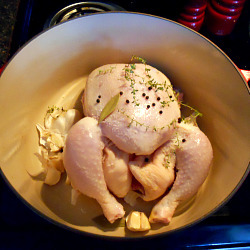 Place the chicken and all stock ingredients in a large Dutch oven and cover with water. Bring water to a boil over medium-high heat and then reduce to a simmer. Cook for one hour until the chicken is tender and internal temperature registers at least 165 degrees. Skim the surface of fat as it cooks. Remove chicken from pot and place on a cutting board. Let rest until it is cool enough to handle. Strain the stock and set aside. When chicken has cooled, shred and set aside. Sift the dry ingredients together in a large bowl. In a small bowl, using a whisk, lightly beat the eggs, chives and buttermilk together; pour the liquid ingredients into the dry ingredients and gently fold. Mix just until the dough comes together; the batter should be thick and cake-like. In a Dutch oven, over medium heat, add the butter and oil. Add the carrot, celery, garlic and bay leaves and saute until the vegetables are soft, about 5 minutes. Stir in the flour to make a roux and continue to stir for two minutes to coat the veggies in flour and remove the starchy taste. Slowly pour in the chicken stock, 1 cup at a time, stirring well after each addition. Add frozen peas and pearl onions. Let sauce simmer, stirring occasionally, until it is thick enough to coat the back of a spoon, about 15 minutes. Stir in heavy cream. Fold the reserved shredded chicken into the sauce and bring to a simmer. Using 2 spoons, carefully drop heaping tablespoonfuls of the dumpling batter into the hot mixture. 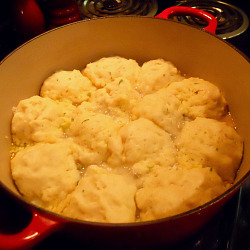 The dumplings should cover the top of the sauce, but should not be touching or crowded. Let the dumplings poach for 10 to 15 minutes until they are firm and puffy. Discard the bay leaves, season with freshly cracked black pepper and garnish with chopped chives before serving. You can become a fan of Peanut Butter Runner and Bakin’ and Eggs on Facebook! I blogged about making Shaksuka on my healthy living blog a few nights ago. I was surprised that it received a lot of positive feedback and quite a few people have indicated that they would like to make this dish. A very quick overview of Shaksuka for those who didn’t read my post earlier this week. Shaksuka is a vegetarian dish of Moroccan/Israeli/Egyptian origins. It’s traditionally served as a breakfast item. It’s a spicy tomato broth with poached eggs. The dish is very quick and easy to make and also healthy. I served the Shaksuka with homemade pita bread for dipping. I had the leftovers the next night for dinner and the flavors were even better after they had a chance to develop. I followed a recipe from Smitten Kitchen with a few modifications. First, I used three jalapeno peppers because I was looking for heat in this dish. I find jalapenos to be pretty hit or miss with the spice level but luckily the ones I picked up at the store were nice and hot. Second, I reduced the garlic to two large cloves. I knew that the five the original recipe called for would be way too much for us. And last, I added turmeric in with the spices. While reading about Shaksuka online I noticed that turmeric was a common ingredient but SK’s recipe didn’t call for it. I have a whole jar in my pantry and love finding ways to use it due to its known anti-inflammatory powers. This is a fun dish for vegetarians and those who love to try new ethnic recipes. Heat olive oil in a 12-inch skillet (that has a lid – don’t use it now) over medium-high heat. Add jalapenos and onions and cook, stirring occasionally, until soft and golden brown, about 6 minutes. Add garlic, turmeric, cumin and paprika, and cook, stirring frequently, until garlic is soft, about 2 more minutes. Put tomatoes and their liquid into a medium bowl and crush with your hands or place in food processor and pulse a few times. Add crushed tomatoes and their liquid to skillet along with 1/2 cup water. Reduce heat to medium and simmer, stirring occasionally, until thickened slightly, about 15 minutes. Season sauce with salt. Crack eggs over sauce, cover skillet and cook until yolks are just set, about 5-7 minutes. Using a spoon, baste the whites of the eggs with tomato mixture, being careful not to disturb the yolk. 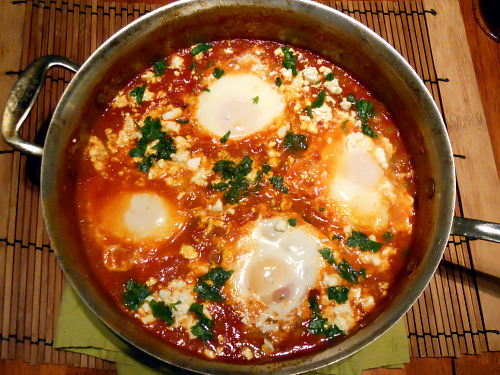 Sprinkle shakshuka with feta and parsley and serve with pitas, for dipping.